We need your help. If you want to stop uranium mining in northern Colorado, you must act now. You can start by signing our petition and voicing your opposition to the Weld County commissioners. See the Stop the Mining menu for details. It all means the same thing: changing water quality to leach uranium out of an aquifer. In-situ leaching is planned in the northern area of the Centennial Project where deposits of uranium are 250 to 600 feet deep. 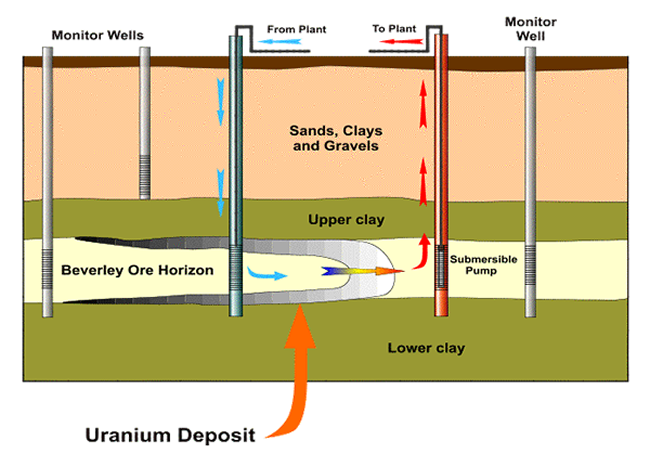 The uranium deposit is within a porous layer of rock such as sand or sandstone. The layer is saturated, usually within an aquifer. The layer is confined between rock layers that are not porous such as clay or shale. The northern area of the Centennial Project meets the criteria for in-situ leaching within the Laramie-Fox Hills aquifer. 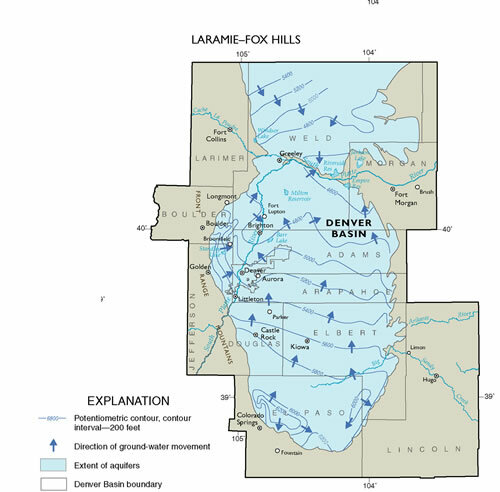 The Laramie-Fox Hills, the Arapahoe, the Denver and the Dawson are the four aquifers that make up the Denver Basin system. These four aquifers are layered within five geological layers. The Laramie-Fox Hills aquifer covers most of the Denver Basin area, approximately 7,000 square miles along the Front Range from Wyoming to Colorado Springs and east to Limon. The Laramie-Fox hills aquifer is below the Arapahoe aquifer, the source of Colorado’s artesian Deep Rock Water. A complex interfingering of sandstones and shales typically restricts movement of water within the Dakota-Cheyenne aquifer. Faults and fractures found associated with geological uplifts throughout the Laramie-Fox Hills and the Dakota-Cheyenne aquifers also limit large-scale ground-water flow. However, these same faults and fractures provide paths for water movement when an aquifer is subjected to additional pressures such as those introduced by ISL mining (see ISL impacts). Commercial, municipal, agricultural and residential wells use the Laramie-Fox Hills aquifer extensively. In February of 2001 there were 33,700-recorded wells. With the population and commercial growth in northern Colorado since 2001, it can be safe to assume the number of wells using this aquifer has increased significantly. Typically under artesian pressure, the Laramie-Fox Hills aquifer’s ground water flows at over 1000 square feet per day. In the northern portion of the aquifer where Powertech’s in-situ leaching has been proposed, movement of the aquifer water is from Wyoming southward toward Greeley and the South Platte River. The proposed Centennial ILS project is situated between Wyoming and Greeley. In addition to water movement within the aquifer there are discharges from the aquifer. While human use is a significant source of discharge within the Denver Basin, the largest discharge is movement between the four Denver Basin aquifers. ILS uranium mining requires the installation of monitoring wells in an attempt to detect when leaks or excursions occur. “Groundwater monitoring bores are drilled into the same aquifer outside the mining zone, and also into aquifers above and below the mining zone (if aquifers are present). It is intended that the wells are closely spaced so that any excursion of lixiviant will be intercepted by a monitoring well. . .” (Report from The Sustainable Energy and Anti-Uranium Service Inc. ). The best information available today to use as an estimate for determining how many drill holes would be within the Centennial project would come from existing Wyoming ISL uranium mines. In Wyoming an ISL well is drilled with monitoring wells in a five spot pattern, 100 feet apart. There are ten wells per acre equaling 60 drill holes x 5,000 – 6,000 acres of the Centennial project. Uranium companies market in-situ leaching as a benign and safe method of mining. The facts show otherwise. Since in-situ leaching problems are not as visible as in an open-pit mining, problems can go undetected for years. Spills, leaks, and mechanical failures plague in-situ mining. Restoration of groundwater is a continual problem. Gavin Mudd writes in his research report An Environmental Critique of In Situ Leach Mining: The Case Against Uranium Solution Mining ( ): “The most critical part of the ISL process is to control the movement of the chemical solutions within the aquifer. Any escape of these solutions outside the ore zone is considered an excursion, and can lead to contamination of surrounding groundwater systems. Some of the most common causes of excursions, identified by international operations in the United States and across Europe, can be through old exploration holes that were not plugged adequately, plugging or blocking of the aquifer causing excess water pressure buildup and breaks in bores, and failures of injection/extraction pumps.” All of these issues will exist within the Centennial project (See ISL impacts). Bookmark with: What are these? For information, email us at info@nunnglow.com. For web problems, email us at webcontent@nunnglow.com.